Supplementary material reads: "Gershon. City desk. Illus. Pancake champion eater. He's San Pedro's champion pancake eater whose title given him yesterday by Kiwanis Club in finals at their weekly luncheon in the YMCA will be up for challenge Saturday, Sept. 22, as the club holds annual pancake party for kids. 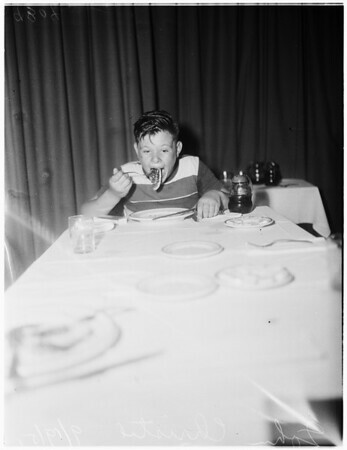 The 'champ' is John Christie, 12, who ate twenty pancakes in 15 minutes. He is shown with stack at start of competition and the last bite which brought him victory. The Saturday party is Kiwanis Club's contribution to the three day Fishermen's Fiesta which begins tomorrow, ends Sunday night".